Congenital absence of one or multiple teeth is called hypodontia. The absence of six or several teeth has been called oligodontia and anodontia is an extreme expression of oligodontia indicating the total absence of dental structures. The prevalence of hypodontia ranges from 0% to 4.1% in the primary dentition and highest prevalence reported in Southern Chinese (4.1%). There is no significant gender predilection reported in primary dentition school children while Brook found female predilection in British school children. Hypodontia is more commonly seen in the anterior region in primary dentition. Mandibular arch is frequently more affected than the maxillary arch,, conversely, Brook and Yonezu et al. reported in the maxillary arch. Mandibular incisors are the commonly missing tooth type in primary dentition, unlike the findings of other reported studies in where the maxillary lateral incisors were the commonly missing teeth., The previous dental history is necessary to eliminate the possibility of extraction of a normal tooth before diagnosis of hypodontia. A dentition with any additional tooth, or structure formed from a tooth germ hyperdontia refers to a dentition that has one, or more extra normal, or abnormal teeth. These supernumerary teeth can arise as a result dichotomy, or extra budding of the dental lamina and the exact etiology is not clearly documented. Several reports have indicated that there is a racial difference in the incidence of hyperdontia. The literature indicates a range from 0.1% to 1.8% for Caucasians, 0.1% for Japanese, and 7.8% for Taiwan school children. Boys are frequently affected in primary dentition inversely; few studies showed a higher prevalence in girls.,, In primary dentition, supernumerary teeth are commonly seen in maxillary arch and very rare in mandibular arch. Almost 50% of the supernumerary teeth were observed along the midline apart from the mesiodens, maxillary incisor region common region that has been reported. Occurrence of these two numerical variants in primary dentition is very rare. The developmental anomalies such as talon cusps, hyperdontia, hypodontia, and concomitant of hypo-hyperdontia have been reported in siblings. Hypodontia and hyperdontia are two extreme numerical variants, the occurrence of these two variants in siblings have not been reported in the literature. Therefore, the purpose of this report is to describe a familial occurrence of hypodontia and hyperdontia in siblings [Figure 1] affecting primary dentition. 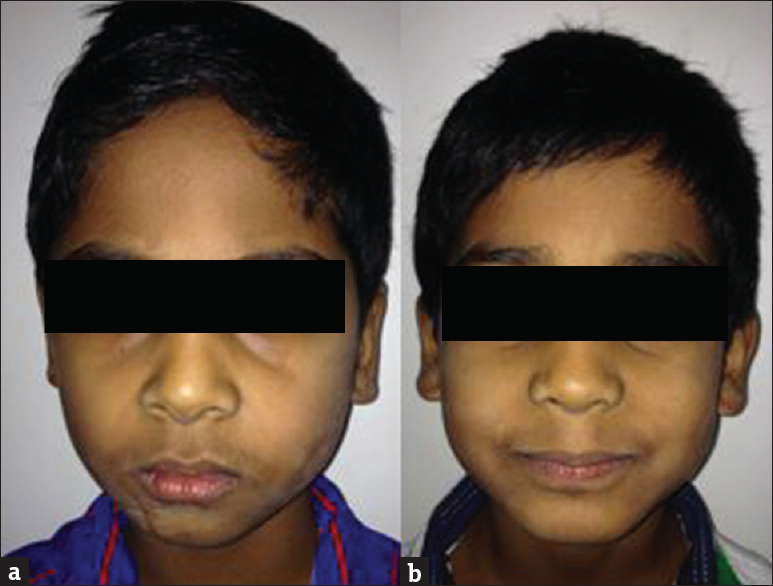 Figure 1: Showing frontal view of both siblings case 1(a) and case 2(b). An 8-year and 1-month-old Indian boy presented to pediatric dental clinic with a chief complaint of delayed eruption of teeth. His medical and dental histories were unremarkable, and he is the first child to a nonconsanguineous couple. Extraorally, he presented with symmetrical face, competent lips with convex profile [Figure 1]a. Intraoral examination revealed that he was in early mixed dentition with inadequate oral hygiene. There was evidence of palatally erupted supernumerary tooth in relation to tooth 61, and no active carious lesions were noted. Radiographic examination showed delayed eruption of tooth 21 due to erupted supernumerary tooth and retained primary teeth 61, 62 [Figure 2]. Extraction of supernumerary tooth and teeth 61, 62 done under local anesthesia and all first permanent molars were restored with fissure sealants as a preventive measure. The patient was reviewed until 6 months for complete eruption of teeth 11, 21. A 5-year and 3-month-old boy, who was younger brother of the same boy, presented with chief complaint of decayed tooth in lower left back region. His medical and dental histories were not remarkable. Extraoral examination showed symmetrical face, competent lips, and strait profile [Figure 1]b. Intraorally, he presented with primary dentition with adequate oral hygiene, and carious lesion was observed in relation to tooth 75. On the right side, one incisor as found to be congenitally missing in mandibular arch, and macrodontic incisor was evident on the right side of the arch [Figure 3]. Radiographic examination confirmed missing incisor on the right side mandibular in primary dentition and presence of all permanent incisors and other teeth for his age. Tooth 75 was restored with composite, and teeth 55, 65, and 85 were restored with fissure sealants. Maxillary mesiodens and supernumerary teeth in maxillary incisor region are commonly seen in primary dentition. The orientation of supernumerary teeth in anterior maxilla could be normal, inverted, and transverse. Almost all of these supernumerary teeth were unerupted (97.0%), this was contrary to the findings of Luten, who reported that all of the supernumerary teeth in his study were erupted; and Humerfelt et al., who reported that 73% of supernumerary teeth found in their study were erupted. The supernumerary teeth found in these patients mostly had an inverted orientation rather than normal or transverse which is contrary to the findings of Huang et al., who found that most mesiodens had a normal orientation. As normally orientated supernumerary teeth often erupt, the high prevalence of inverted teeth found in this study may explain why 97.0% of the supernumerary teeth were unerupted. It has been reported that supernumerary teeth may cause crowding, delayed eruption, displacement, rotations, resorption, and cystic changes. Similar in the present case, erupted supernumerary tooth caused delayed eruption of tooth 21 and rotation of tooth 11. However, the erupted supernumerary tooth was extracted, and the patient (Case 1) was reviewed for 6 months until the eruption of both 11, 21 completely. Moreover, an association between hypodontia and ankylosis of primary molars, enamel hypoplasia, peg-shaped incisors, and taurodontism has been documented. Several studies have shown that most of the cases of hypodontia in the primary dentition are followed by hypodontia in the permanent dentition in the same region.,, Contrarily, in our Case No. 2, hypodontia was evident in primary dentition only, and it was not associated with permanent dentition. Mutations in the genes of MSX1 and PAX9 have been related with oligodontia in the posterior teeth, and the mode of inheritance is autosomal dominant., It has been reported that the differences in gene frequency, the inheritance mode, and autosomal recessive are responsible for the variations in prevalence figures. More recent studies have identified genes that cause the absence of teeth in generations of nonsyndrome patients similar to this case. The occurrence of hypodontia and hyperdontia alone in primary dentition is extremely rare. The etiologies for both numerical variants have not been clearly stated. However, it has been hypothesized that both environmental and genetical factors are responsible. The use of panoramic radiography is recommended, together with clinical examination for the identification of these numerical dental anomalies. Identifying and counting the existing teeth would assist to recognize missing teeth. Nevertheless, it must be kept in mind that the development of teeth may vary markedly among patients. The occurrence of these two numerical variants in primary dentition is very rare. Hypodontia and hyperdontia are two extreme numerical variants, the occurrence of these two variants in siblings have not been reported in the literature. To the best of our knowledge, these are only Indian participants that have been reported on the occurrence of two numerical anomalies in siblings affecting primary dentition. A genetic correlation of hypodontia and hyperdontia has been described and suggested for further studies. King NM, Tongkoom S, Itthagarun A, Wong HM, Lee CK. A catalogue of anomalies and traits of the primary dentition of Southern Chinese. J Clin Pediatr Dent 2008;32:139-46. Grahnen H, Granath LE. Numerical variations in primary dentition and their correlation with the permanent dentition. Odontol Revy 1961;12:348-57. Mallineni SK, Yiu CK, King NM. Schwartz-Jampel syndrome: A review of the literature and case report. Spec Care Dentist 2012;32:105-11. Magnússon TE. Hypodontia, hyperodontia, and double formation of primary teeth in Iceland. An epidemiological study. Acta Odontol Scand 1984;42:137-9. Yonezu T, Hayashi Y, Sasaki J, Machida Y. Prevalence of congenital dental anomalies of the deciduous dentition in Japanese children. Bull Tokyo Dent Coll 1997;38:27-32. 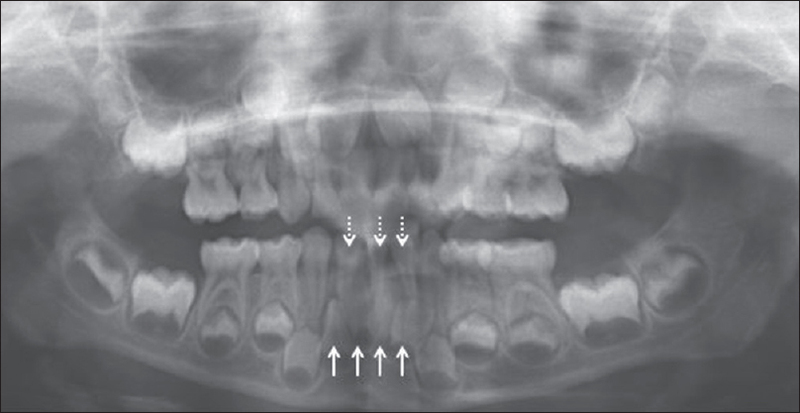 Järvinen S, Lehtinen L. Supernumerary and congenitally missing primary teeth in Finnish children. An epidemiologic study. Acta Odontol Scand 1981;39:83-6. Yusof WZ. Non-syndrome multiple supernumerary teeth: Literature review. J Can Dent Assoc 1990;56:147-9. Huang WH, Tsai TP, Su HL. Mesiodens in the primary dentition stage: A radiographic study. ASDC J Dent Child 1992;59:186-9. Luten JR Jr. The prevalence of supernumerary teeth in primary and mixed dentitions. J Dent Child 1967;34:346-53. Mallineni SK, Manan NM, Lee CK, King NM. 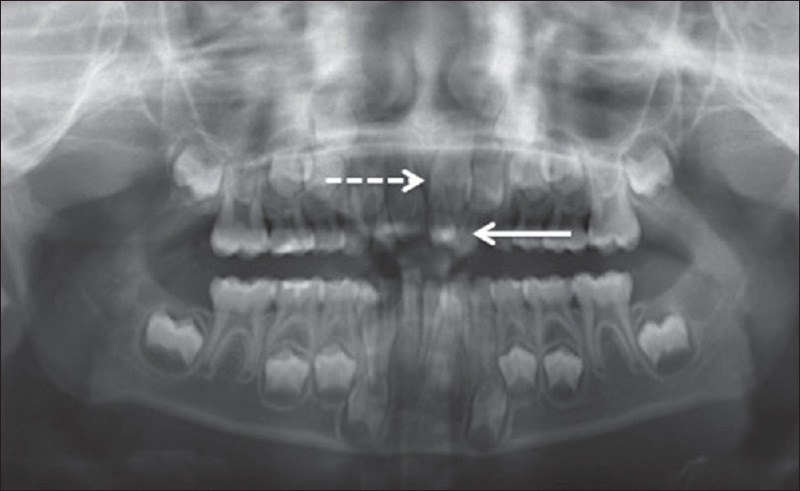 Talon cusp affecting primary dentition in two siblings: A case report. Rom J Morphol Embryol 2013;54:211-3. Marya CM, Kumar BR. Familial occurrence of mesiodentes with unusual findings: Case reports. Quintessence Int 1998;29:49-51. Fiszon E. Multiple agenesis in two siblings: Report of case. ASDC J Dent Child 1986;53:281-2. Hattab FN, Yassin OM, Sasa IS. Oral manifestations of Ellis-van Creveld syndrome: Report of two siblings with unusual dental anomalies. J Clin Pediatr Dent 1998;22:159-65. Mallineni SK. Supernumerary teeth: Review of the literature with recent updates. Conf Pap Sci 2014;2014:6. Proff P, Fanghänel J, Allegrini S Jr., Bayerlein T, Gedrange T. Problems of supernumerary teeth, hyperdontia or dentes supernumerarii. Ann Anat 2006;188:163-9. Skrinjarić I, Barac-Furtinović V. Anomalies of deciduous teeth and findings in permanent dentition. Acta Stomatol Croat 1991;25:151-6. Lai PY, Seow WK. A controlled study of the association of various dental anomalies with hypodontia of permanent teeth. Pediatr Dent 1989;11:291-6. Nik-Hussein NN, Abdul Majid Z. Dental anomalies in the primary dentition: Distribution and correlation with the permanent dentition. J Clin Pediatr Dent 1996;21:15-9. Klein ML, Nieminen P, Lammi L, Niebuhr E, Kreiborg S. Novel mutation of the initiation codon of PAX9 causes oligodontia. J Dent Res 2005;84:43-7. Kapadia H, Mues G, D'Souza R. Genes affecting tooth morphogenesis. Orthod Craniofac Res 2007;10:105-13. Mallineni SK, Jayaraman J, Yiu CK, King NM. Concomitant occurrence of hypohyperdontia in a patient with Marfan syndrome: A review of the literature and report of a case. J Investig Clin Dent. 2012;3:253-7.